Photo courtesy Gilroy Garlic Festival * The cook-off stage will host several cooking competitions throughout the three-day Gilroy Garlic Festival. Think you’ve seen it all when it comes to cooking with garlic? Think again. 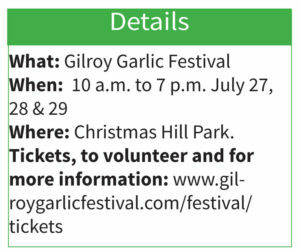 The 40th annual Gilroy Garlic Festival will feature three days of exciting cooking competitions and demonstrations. In addition to the traditional Great Garlic Cook-Off, Champions for Charity competition, the Gilroy Garli-Que BBQ Challenge, a Backyard BBQ Ribs Challenge, and the Garlic Showdown, this year’s event features the inaugural Garlic Chef Jr. contest, as well as Iron Chef Michael Symon. There will be plenty of celebrity sightings on the Challenge Butter Cook-Off Stage. A co-host of “The Chew,” Symon presides over Sunday’s Garlic Showdown, which will highlight four professional chefs battling for a $3,000 prize. Afterward, he’ll give a cooking demonstration. On Saturday, Olympic champion and Food Network star Brian Boitano emcees the Great Garlic Cook-Off, as eight amateur chefs from across the U.S. show off their skills. 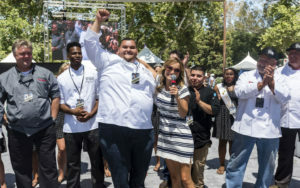 MasterChef Season 7 winner Shaun O’Neale, a Festival favorite, returns to host the Champions for Charity battle, as well as the new Garlic Chef Jr. event. Two 2017 Gilroy Garlic Festival attendees enjoy mouth-watering food from Gourmet Alley. The junior chefs range in age from six to 15. Each contestant must create one baked or grilled dish containing at least six cloves of garlic. They’ll be allowed to have one adult sous chef on stage with them, if they choose. A panel of expert judges will evaluate each dish for taste, appearance, creativity, and use of garlic. The winner will receive a notebook computer valued at $500. The event is open to chefs younger than 18, and begins at 2 p.m., July 27. The winner will be announced at 4:15 p.m.
Also happening Friday, is the third annual Champions for Charity challenge. Four two-person teams of local first responders and military professionals will compete in a three-round cooking challenge. The elimination rounds include Appetizer, Entrée, and Dessert. After each round, a panel of judges will evaluate taste, creativity, appearance and use of garlic to determine who will move on to the next round. The winning team will receive $3,000 for the charity of their choice. The competition gets underway at 11 a.m., with the winners announced at 1:30 p.m. 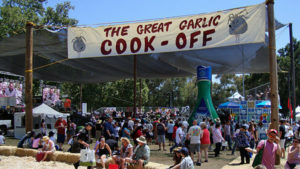 The Great Garlic Cook-Off has become one of the country’s most prestigious amateur cooking competitions. Beginning at 10 a.m. and hosted by Brian Boitano, the event pits eight competitors against each other. One is from Gilroy, and another from Cupertino, but the remainder are from Illinois, New York, Florida, Oklahoma, and southern California. The Great Garlic Cook-Off concludes at 12:15 p.m., with a grand prize of $5,000 and the coveted garlic crown awarded to the winner. 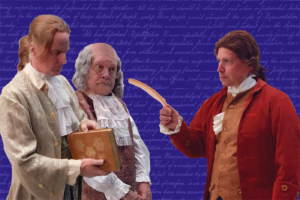 Afterward, Boitano will share one of his favorite garlic-based recipes and answer questions. Also on Saturday, the competition will start smokin’ (literally) on the other side of the park as BBQ teams face off in the third annual Gilroy Garli-Que BBQ Challenge. This event combines an officially sanctioned Kansas City Barbeque Society contest for the pros Saturday with a Backyard BBQ Ribs Challenge for amateurs on Sunday. 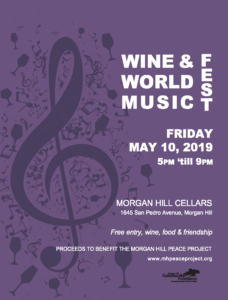 Guests can purchase samples and then cast their votes for the “People’s Choice” awards. The Gilroy Garli-Que BBQ Challenge winner will be announced at 5:30 p.m. Saturday. The Backyard BBQ Rib Throwdown begins at 8 a.m. Sunday, with a turn-in time of 1 p.m. The pros take center stage on Sunday. Iron Chef Michael Symon will be on hand to oversee the Garlic Showdown, one of the Festival’s biggest draws. At high noon Sunday, Michael Symon will emcee the Garlic Showdown on the Challenge Butter Cook-Off Stage. Symon is the perfect host for this Iron Chef-inspired competition which features local professional chefs squaring off in a culinary battle for a $3,000 cash prize and ultimate bragging rights. After the winner is announced, Symon will perform a live cooking demonstration and answer questions from the audience. Though this will be his first appearance at the Gilroy Garlic Festival, Symon is no stranger to intense cooking competitions. 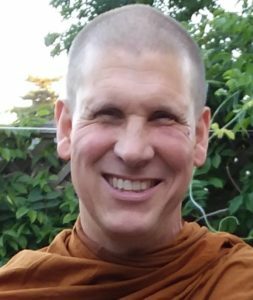 After gaining fame as host of The Melting Pot on Food Network, he went on to win season one of The Next Iron Chef in 2008, earning him a permanent spot on the roster of esteemed Iron Chefs. Symon continues to appear on multiple cooking shows, including Food Feuds and his own Cooking Channel show Symon’s Suppers as well as Cook Like an Iron Chef, The Next Iron Chef, and Iron Chef America.